Gilbert Andrew Chavarria, suspect in gropings. Image via KGTV. An Escondido man who broke into several North County homes and sexually assaulted young girls as they slept in their bedrooms pleaded guilty Friday to 13 felony charges, including assault with intent to commit lewd acts on children. Gilbert Chavarria, dubbed “the Creeper,” will be sentenced to 100 years to life in prison on Jan. 4. The 29-year-old former auto mechanic admitted breaking into several homes in Escondido and San Marcos — cutting or removing window screens to gain entry — during early morning hours in June and July of 2013. 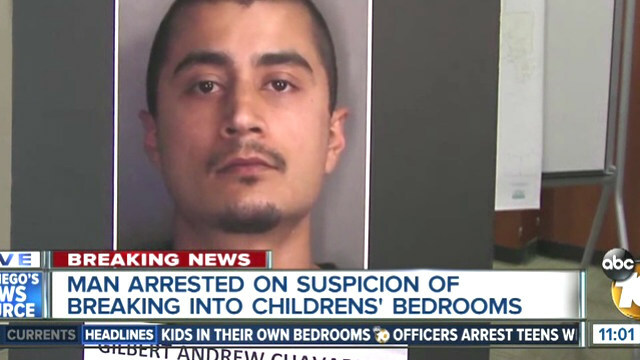 In those cases, Chavarria would cut holes in the children’s sleepwear and molest them, according to authorities. Many of the assaults happened while parents were sleeping in the same room as their children. Chavarria also admitted molesting two 8-year-old girls and a 5-year-old in 2012 at homes where he knew the children, authorities said. The nine victims ranged in age from 5 to 15 years old. Investigators recovered DNA from a family member that linked all of the attacks to the same individual. When officers tried to make contact with Chavarria in August 2013, he fled. On Feb. 5, 2015, after the DNA evidence was submitted to the California Department of Justice, Chavarria was identified as a suspect in the series of sexual assaults. He was arrested a short time later.